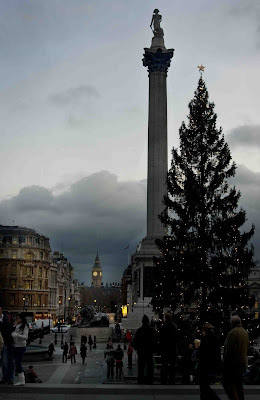 Every year since 1947 a Christmas tree like this one stands in Trafalgar Square. A gift from Norway in friendship and gratitude for the support during WWII. Decorated in traditional Norwegian style with 500 white lights. The tree from the forests around Oslo is always 20-25ft tall. This is such a beautiful skywatch photo. Looks like a picture right out of Dickens! I love the way you framed this photo with Big Ben peeking out in the background. Very nice job. I agree with Tanya, it does look like something out of Dickens. This is just a fantastic shot, with so much to look at. The different greys and neutrals coupled with the points of yellow light are a fascinating palette. I like that you got so many people into it, too, at different scales. This I did know and seen many times. It's very striking angle you've got to show it off with Big Ben in Background. Beautiful shot. I enjoyed the history lesson also. Lovely. Very timeless looking. Makes me wish I were there right now. This is a very fine photograph, Mo. I enlarged it and the understated tree looks so wonderful with all the landmarks. Definitely a keeper. Happy Christmas! I think this photo would make a lovely Christmas card. I love it. A wonderful SkyWatch. Wow! Another absolutely classic shot! Very nice tree. I just saw a thing on TV, I think it was an out-takes thing, where a Blue Peter presenter was putting the star on top of the tree and he dropped it! Ooops!